I have been told that I tend to flip things and make it all about me. It’s something that I do subconsciously, a learned habit from my childhood trauma. I grew up in a family where “kids were seen but not heard”, guilt and shame were used to control, it was not safe to talk about emotions, secrets were guarded close, and to get approval from my parents and grandparents I needed to be perfect and be “good” in everything I did. As a child, all I wanted was to be seen, heard, and loved. Well, that set me up! I internalized a belief that I needed to be perfect and not fail to have value and worth. And when I didn’t get that approval from others, I had to search it out to ensure I was ok. It has been hard for me to love myself without the need to have other people validate that truth. This was one of the crippling behaviors that destroyed my marriage. Not only did I use addiction to medicate the internal belief and subsequent pain that I was not worthy of love, but I put unrealistic expectations on my ex to give me a positive sense of self-worth that I believed I needed to survive. When she didn’t come through with those expectations, I regressed into a child by blaming, controlling, manipulating, and shaming her for not giving me what I needed. I was unfair to her. Then comes recovery. I have grown in many ways, but I still haven’t been able to stop trying to shine the spotlight on myself. “See how perfect my recovery is dear? Am I worthy enough now?” This mentality pushed away any chance of reconciliation my marriage could have had. I mean, who wants a spouse who constantly seeks approval? In the past six months, I have learned an incredible amount about myself, my triggers, and I’m finally starting to heal. I still struggle daily with the direction my life is going. I still struggle with the pain and grief of loss. I still struggle with the constant longing of wanting to stop my divorce and make my marriage work. I see the grace of how much I have grown and I now have so much more to offer my children because of my recovery. But I still battle that internal belief that I failed my ex, I failed my children, I failed my marriage. My personal goal in recovery is to learn how not to make it about me. For the first time, I’m learning how to actively listen to others. It’s an interesting phenomenon. I can hear a voice in my head that says, “Shut up Phoenix. You’ve talked too long,” and I stop talking and start asking questions. I start listening. In listening to others, I have found that there are many people who struggle with the same issues I do. I truly have empathy over the pain they are feeling. I have been there myself and it can become excruciating. I have helped guide some of these individuals through my own personal experience of strength and hope. I don’t want anyone else to experience the loss of a marriage as I have. I want to intervene early. I want to explain that it’s important to care for yourself first, then the relationship with your spouse, and finally your children. I want to lecture that both our spouses and ourselves need outside friends. I want to teach that we shouldn’t expect our spouse to be everything to us; friend, lover, companion, parent, child, helper, etc. You get the picture. And if you have any childhood issues that need resolving, please don’t wait to see a therapist. Work on those issues now, before they become a thorn in your marriage. I want to help save relationships. I want to help save families. However, through my blogging, I have found a much deeper meaning about what “Together” means to me. This is not just about saving relationships. “Together” initially referred to a support network, a community of people, who could collectively share their stories and give one another strength and hope. But true healing will come when our adult self learns how to successfully nurture and care for our inner child. We need to learn how to parent ourselves (that voice in our head) with compassion and love. I want to help others learn how to integrate their inner child with their adult self so Together We Can Heal. This is the core to maintaining and saving relationships and families. I have followed other inspirational speakers and bloggers, and unbeknownst to them, they have become my mentors. These are the ones I have read books about, listened to on podcasts, or I have followed their blogs. They have overcome addiction, they have survived the pain of divorce, or they have grown through the grief of loss. They have become reborn and live a beautiful life of peace and serenity that only those of us who have suffered and arisen from out of the ashes understand. I have read self-help books. I have listened to podcasts. I have done workbooks. I have done 12 Step Work, EMDR (Eye Movement Desensitization and Reprocessing), Somatic Experiencing, EFT (Emotional Feeling Technique), DBT (Dielectric Behavioral Therapy), Art Therapy, Group Therapy, Couple Therapy, Individual Therapy, acupuncture, Tai-Chi, Yoga, etc. Pretty much, you name it, I have tried it, or I’m willing to give it a try. I want to stop the internal pain that causes me to regress into an adult child and react as a child reacts. I’ll see some progress and improvement, but then I fall back into old habits. It always feels like one step forward, two steps back. Sometimes we are our own worst critics. I have friends that point out how I used to be a year ago compared to today and I realize that I am moving forward. Just not at the pace I want to. It’s more like two steps forward, one step back. I want to act like a healthy adult who can regulate his emotions. I need to ask Rafiki for advice. Rafiki is the one friend I’d send my journal entries to. He always gives me blunt, honest feedback. He has seen right through my self-pity, negative self-talk, in addition to my blaming, controlling, and manipulating behaviors. All my previous writings allowed me to get out of my head. But, then I put all that crap on paper instead. I made connections and had some insight, but I was doing the same things and thinking the same thoughts. I was ruminating, not learning. Change was slow. At a snail’s pace, slow! Once again I think of a being an instructor. The one time in my life where I was the most on top of every aspect of my career was when I was teaching it. Maybe that is the next step to my healing? To teach with integrity means I need to follow my own lessons. Then I wrote another. And another. And before I knew it, the floodgates had opened. My blogs started flowing like water rushing down a spillway. This was a new way for me to communicate. I felt more healing through this process. I knew I had, and still have, a long way to go, but I no longer felt stuck running in place on a treadmill. As of this writing with the creation and publication of my website, I have written 26 blog entries. I have five more that I am currently in the process of writing and many more sitting in the cue waiting to be written. I will be releasing these at different intervals, back dating the entries, while also building my website. 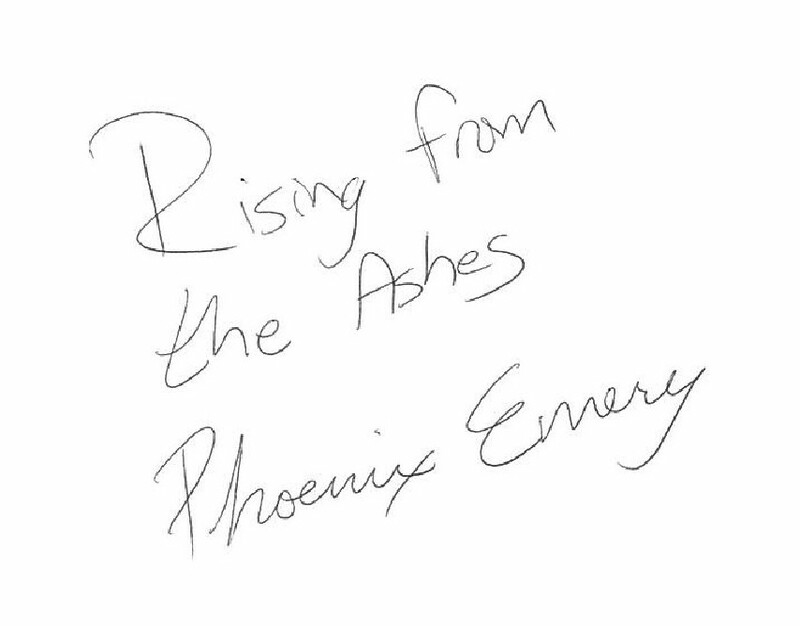 I am rising from the ashes. I always remind myself of this comment when it seems like “I can’t get it”; especially when I had just regressed with my ex and I could tell by her body language, anger, and comments, I just validated her reasons for wanting to divorce me. If I’m aware of what needs to be changed, then, I have taken the first step towards that change. That thought is much better for my psyche than berating and placing guilt upon myself for continuing to make poor decisions and hurtful actions. I have noticed that as an observer, my blog entries no longer keep me stuck as a victim. I am finally stepping off the Karpman Triangle. As a victim, I’d quickly go into perpetrator mode and attack my ex. Once I hurt her, I’d try to rescue her. And when she couldn’t accept my “need” to take care of her, I’d drop back into the victim mode again. It has taken divorce to teach me how to get off that triangle. My ex calls that my “craziness.” She’s correct. Many years of dealing with someone else’s crazy only makes you go crazy yourself. So, what is the goal with Together We Can Heal? Initially, this is a way for me to continue my journey of recovery and heal from the pain and loss of my divorce. If writing this way helps me, then hopefully there are some nuggets of insight that can help you too. My goal is to connect with others and allow all of us the forum and a place to be vulnerable and heal from our painful past. I want to give others a place to have the strength to overcome challenges in their daily lives. I want us to see that there’s hope after loss. I also want us to not blame our partners for our behaviors, but to learn what piece we continue to cause in our relationships, and learn how to change that behavior. We can’t change our partners, our family, our children, our friends. That is their separate journey. But we can dig in deep to find out what our little child needs and learn how to take care of that child ourselves, not expecting others to do it for us. And when we give ourselves what we need, others will see the change and want what we have. We can then pass on what we’ve learned to help others out of their emotional pain and live a life of peace and serenity. Connection with one another: to have an online support community that we can connect to at anytime, anywhere. To challenge one another: the last person I can accept criticism about my behaviors is my ex. I am too emotionally invested in her to accept her opinions of me as not an attack on my character and who I am as a person. I believe we all struggle with accepting critique from loved ones. By challenging each other out of love, without the emotional connection of a relationship, I believe it opens us up to becoming aware of the changes we need to make to grow and change. Our relationships will ultimately improve through this process. Eventually a Reading Club: It would be cool to have an online reading club where we take one self-help book a month and work through it together. This promotes accountability and collective insight that we wouldn’t have doing it alone. A section of Peaceful Serene Pictures: I would like to set up a slideshow that users could put on when they’re having a rough day. Maybe even add relaxing music to the scene? We’ll see. Links to other sites for further support. Guest Posts: I am sure there are others out there that also have stories of strength, courage, and healing to tell. If writing my story has been helpful in my healing journey, I would eventually love to open the doors so others can use this as a forum so they can heal too. The ability to eventually provide financial support for those who are struggling: I have no idea how to start a non-profit organization, but that’s a future goal that could possibly come from this site. Who knows: Why not plan an annual retreat somewhere where we can all physically connect and meet and share our mistakes and triumphs with? The options are endless. What would you be interested in seeing? Whenever I start something I tend to think BIG! I come up with ideas that are so outrageous and huge and then find excuses as to why they can’t work. I’m good at self-sabotage. I need to remember to take baby steps. So, for starters, I’ll just start a blog about what I am struggling with. I’ll open it up for comments and we’ll see where it takes us. My blog may initially come across as making it about me, but it’s my first step to be vulnerable enough to allow others to feel comfortable to do the same. This site is about integrating our inner child with our adult self so that Together We Can Heal. This site is about connection. This site is about interpersonal growth. This site is about being vulnerable with others so that Together We Can Heal. Come join me on a journey of self-discovery my Fledglings, Rise From The Ashes and let’s Soar With The Eagles.